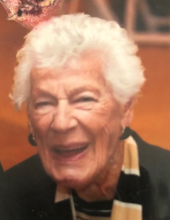 Edith E. Armstrong, age 87 of Saylorsburg, PA formerly of Nutley, NJ passed away peacefully and surrounded by family January 29, 2019 at her and her daughter’s home in Saylorsburg. She was the wife of the late David Armstrong who passed away in 1989. Edith was born in Passaic, NJ on November 8, 1931, daughter of the late Edgar Lee and Lillian (Ellis) Wagoner. Edith had worked as a Medical Research Secretary of Hoffman LaRoche in Nutley, NJ for 30 years until retiring in 1992. Upon retirement, her love was her grandchildren and she enjoyed her time taking care of them. She was a former member of Grace Episcopal Church in Nutley, NJ where she taught Sunday School for over 20 years. In her spare time Edith attended ceramic class on Russell Ave in Nutley. She loved to crochet prayer shawls and made many needlepoint projects. She loved animals and she rescued many. Edith attended Salem United Church of Christ in Gilbert. We have been blessed with Edith in our lives. She will be deeply missed by her children: Susan Smith and her son in law Anthony of Saylorsburg, PA; Helen Woolley and her husband Michael of Matamoras PA, John Armstrong and his wife Jayne of Lombard, IL, nephew Steven Wagoner and his wife Linda, niece Joyce Ames and her husband Nat, along with many cousins. She was the loving grandmother to her eleven grandchildren: TJ Bozec, Ian, Scot, Jenna and Adam Armstrong of Lombard, IL; Corey, Brendon and Ashton Smith of Saylorsburg; Michael, Ryan and Erin Woolley of Matamoras, PA and two great grandchildren : Chelsea Smith and John Armstrong. She is also survived by a brother: Richard Wagoner of Denville, NJ. She was preceded in death by a brother: Edgar Lee Wagoner. A Memorial service will be held at a later date to be announced by the family. To send flowers or a remembrance gift to the family of Edith E. Armstrong, please visit our Tribute Store. "Email Address" would like to share the life celebration of Edith E. Armstrong. Click on the "link" to go to share a favorite memory or leave a condolence message for the family.